As my food hero, Anthony Bourdain, says, every culture has its own version of ‘meat in tube form’. Belgium is no exception. Although boudin isn’t a strictly Belgian invention, it’s part of the fabric of food culture here and love it, or hate it, everyone has an opinion on it. 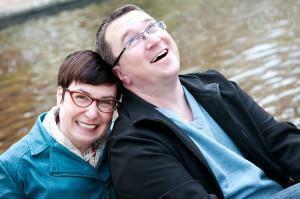 Charcuterie is one of the (many) foods we’ve developed a passion for, since moving to Europe. Sausages, hams and patés, weren’t my cup of tea back in Canada, but Europeans take cured meats to a whole other mouth-watering level. That said, many years passed, before I dared taste the pasty looking boudin. For the uninitiated, boudin is a type of sausage, normally made from pork, but sometimes chicken or veal. It is typical to Belgium and France, but Germany, French Canada and the Cajuns of the southern United States, all have their own versions. 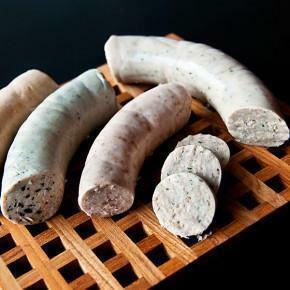 Boudin, in Belgium, comes in two main varieties: boudin blanc (white boudin) and boudin noir (black boudin). Boudin noir gets its dark red, almost black, colour from the addition of blood. Boudin blanc is very pale in colour, as there is no blood added, and the mixture often contains milk. I’ll be the first to admit, neither of these combinations sounds particularly appetising. But the addition of herbs, spices and other ingredients, by a true boudin master, can elevate these unappealing looking sausages to new heights. One of our favourite varieties is the boudin Liège, named after the city in Wallonia. 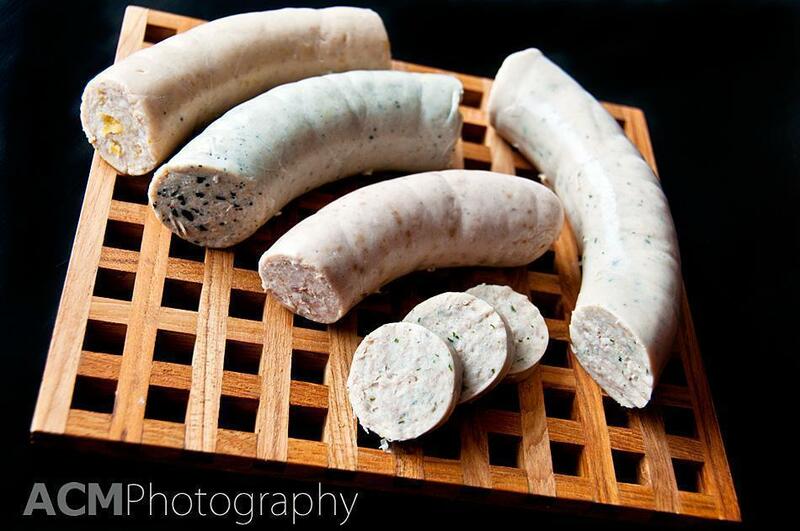 This is a type of boudin blanc, with the addition of fresh herbs and milk – delicious. I was inspired to write about boudin today, after a visit to my local street market. One of our favourite stalls is run by a Walloon woman, who makes the most incredible patés and boudins. Normally her offerings extend to the blanc, noir and Liège varieties, but today she had many other flavours on offer. We arrived home with samples of our favourite boudin Liège along with apricot, nut and truffle boudins. You’ll see from the photo, we only chose varieties of boudin blanc, as we both find the flavour of boudin noir a bit harsh. But that’s the great thing about boudin in Belgium, there is a taste for everyone. 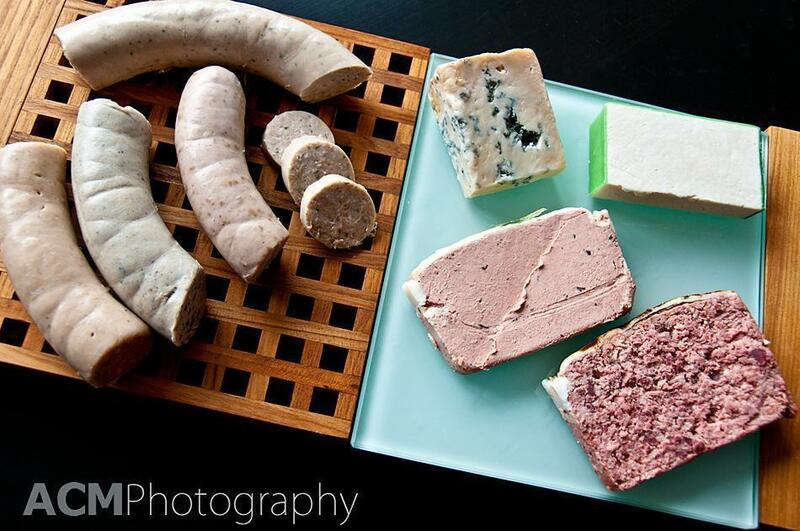 If you’re going to try boudin for the first time, make sure it is homemade and using fresh ingredients. You’ll find artisanal charcuteries at many of the markets in Belgium. To taste the boudins we buy, head to Place St. Josse on Thursdays and look for the charcuterie cart in front of Le Delizia restaurant.